While fishing for salmon it's very important that you have & carry at all times a suitable landing net that can be used to stabilise your salmon prior to releasing. Unfortunately even the very best landing net manufacturers are often found lacking when it comes to the choice of net bag that they fit to the frames of their salmon nets. It wasn't that many years ago when knotted net bags were banned as the the knotted versions were causing too much damage to the flanks and mucus membrane of fish. That was definitely a step in the right direction even though only a half way measure. A good net bag should have a soft knotless fine mesh bag which avoids tearing a salmon's fins unlike the often larger meshed versions you see on most salmon nets. It's just not right to return a salmon that has had its fins split as logic should endorse so take the large meshed net bag off your net's frame and destroy it. The best thought out landing net bag designs are ones that have a flat base but unfortunately most nets currently do not have this feature as most of them aren't thought out properly enough. A flat based net when the salmon is lifted to the waterline will turn the salmon onto its side which makes it much more stable for unhooking. The triangular shape of the net bag you see here is another excellent feature as the head of the salmon will inevitably find one of the corners of the net bag which again helps with stabilising the fish for unhooking purposes. Soft mesh with a flat base are the two main features you should be looking for and some nets these days are now coming fitted with mesh that's rubber coated which again is much kinder to the fish. 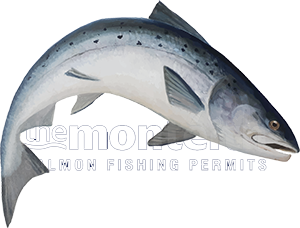 These are the features to look out for with the well being of your salmon in mind.